Every Sunday in June, the Waterfront Museum & ShowBoat Barge will present “Circus Sunday”, an afternoon of circus and clown performances featuring some of New York’s best circus entertainers. They run 2 shows a day at 1pm and 4pm, and every Sunday they will feature new acts and different artists. 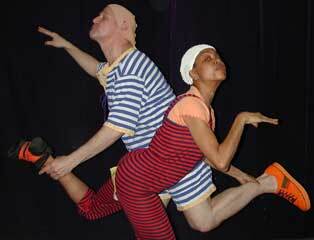 Jugglers, trapeze artists, clowns, acrobats, and eccentric characters make up the performers. Advance Tickets are $12.00 for Adults, $6.00 for youth (under 12). If available, tickets are sold for $15/$8 on the day of the show. Call (877) 238-5596 to place your order or purchase online through SmartTix. The Waterfront Museum & Showboat barge are moored next to Fairway (off of Conover Street) in Red Hook, Brooklyn. BILLY BONES- Clowning’s Black Pearl of the Caribbean! ILKA-One of Germany’s most loved jugglers presents her new mesmerizing solo act. THE MERMAIDENS -Sisters Sophie and Dalia Sharps with their unique and daring trapeze routine. TWO LEFT FEET DANCING DUO- Comedy hoofers Ron and Julie. ACROBATIC ADAGIO- Kenny Lindemann and Melinda Ortiz debut a dynamic pas de deux. THE DOLL- Natasha, a living doll, comes to life in a lyrical aerial dance on trapeze. AMBROSE MARTOS- the hairiest member of the comedy trio Happy Hour brings his leg-splitting antics onboard. THE POETICS OF POI-Lucien Hybel in a dazzling display of manipulation. NATHALIE ENTERLINE- Nathalie’s virtuoso hat and cane act blends dance with sublime elegance and style. THE MERMAIDENS – Sisters Sophie and Dalia Sharps are back with their unique and daring trapeze routine. GORDOON!-A treat for all ages! 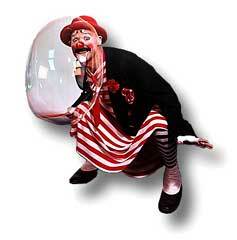 Long time and legendary Big Apple Circus Clown, Gordoon makes his first appearance with CIRCUSundays. CARLO PELLEGRINI -Juggler, dancer, ringmaster, clown – his unique showmanship combines them all. DIKKI- Clown Prince of the Slackwire. JAZMIN MENT: Gymnast/dancer Jazmin brings her artistry on aerial silks to CIRCUSundays. MEATLOAF THE CLOWN- Rubberfaced, rebellious, and a virtual buffoon. THE CAT- Her sinewy contortions have audiences purring with delight. CHINESE VASES – Classically trained in the ancient art of Chinese Vase Manipulation, juggler David Sharps (owner of the Waterfront Museum!) is the only American in the U.S. to present this masterful and amazing act. or call our tickets hotline (877) 238-5596 to place your order.